For 30+ years, RCS has been educating, supporting and advising rural businesses on managing all aspects of their business. Our success and reputation are due, in part, to our approach of looking at the whole business and not just certain components in isolation. 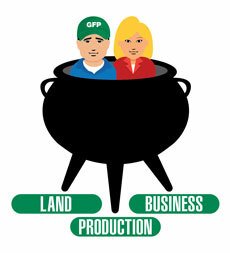 The analogy of a three-legged pot is used where the three legs represent business, production and land management. The fourth key component of people management sits in the pot. No business can exist without people and the success of what those people can do is dependent on how well they manage their land, money and production systems (e.g. crops, sheep, cattle). Taking this a step further, the grazing industry in general does a poor job of managing its grass resource. This is due to a lack of knowledge and lack of willingness to change. As time passes, this is placing the industry under pressure as the capacity of the land to produce fodder reduces in line with decreasing ecological health and function. This reduction in carrying capacity is the opposite of what is required when costs are increasing and prices have remained relatively static or volatile. Every business must aim to sustainably maximise profitability from available resources. The RCS Pyramid of Profit visually shows that for profit to be generated in a grazing business, ecological health is essential. Regenerative grazing practices that work with nature to maximise the bottom half of this pyramid and the ‘land’ leg of the three-legged pot are an essential strategy for any grazing operation. The RCS Regenerative Goal: To profitably leave our country in better condition. The objectives of regenerative grazing (e.g. time control grazing) are to manage the ecosystem with grazing animals to maximise the ecological rebuilding of biodiversity, water and nutrient cycling and energy efficiency within the local ecosystem. 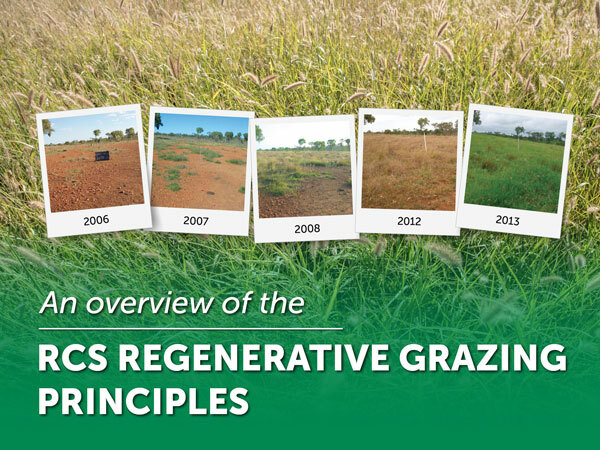 Through extensive research, observations and trial and error, RCS has developed the following six principles of regenerative grazing, which are essential for a successful grazing operation. The first iteration of these principles were developed by Dr Terry McCosker after completing a Churchill Fellowship looking at what key principles resulted in grazing successes and grazing failures around the world in 1990. The key is to implement as many of the 6 principles as economically and practically feasible, and in line with your goals. What follows is an introduction to the principles. For more information on these principles and how to implement them into your business, attend or repeat one of our courses. Regenerative Grazing Principle 1 – Plan, monitor and manage the grazing system. Professional managers are constantly undergoing a cycle of planning, monitoring against that plan as they implement and managing changes as they go. Management skill and expertise is the driver of any successful grazing system. The key aspects to plan, monitor and manage fall into implementing principles 2-6. Livestock grazing activities in individual paddocks for any grazing system. What rest periods were provided. The severity of each graze (light, medium or heavy). Monthly and rolling 12-month total rainfall. Stocking rates against benchmark carrying capacity. 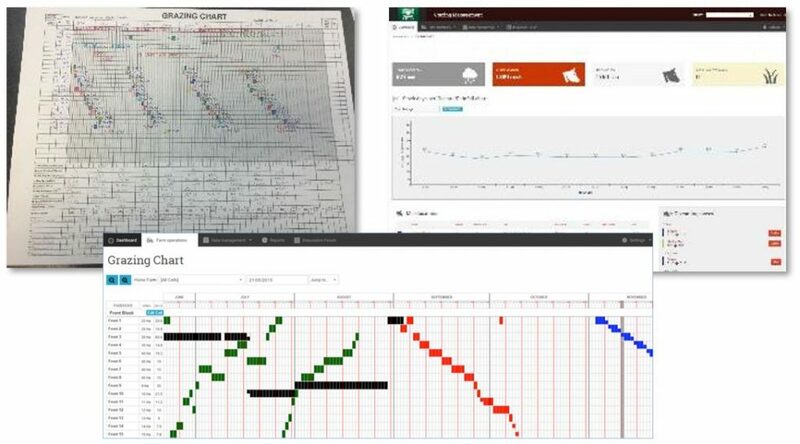 Hence, grazing charts are used to monitor stocking rates and carrying capacities to allow timely destocking and restocking decisions to be made. This also eliminates drought periods where many agricultural businesses haemorrhage economically through drought feeding practices. Grazing charts can be completed using a paper system (available from RCS) or a via a new online grazing management system called MaiaGrazing. We recommend that you attend one of the RCS courses that cover grazing management to understand how to use this management tool effectively. Other monitoring tools that can be applied are photo points, basal area data and soil monitoring. Photo monitoring points are recommended to be set up and maintained as not only do they show changes achieved for outside purposes, they are a good reminder of the work done and outcomes achieved. Following are three separate examples of ecological renewal achieved by RCS clients through implementation of these grazing principles. The transformation seen in the photos at these properties occurred over a 6-7 year time frame. Phase I have a small green leaf area therefore photosynthesis is restricted and energy for growth is supplied by root zones. Overgrazing at this time will severely tax the plant and continued grazing will cause it to eventually die. The second stage (Phase II) is characterised by an abundance of green leaf area and an actively growing plant. Both leaf areas and root zones are expanding with energy being supplied from the sun through photosynthesis. This is the prime time for grazing the plant and short graze periods will significantly extend this phase. Plant production is at its optimum as is animal production. The goal of regenerative grazing is to manage the plants for this phase with the strategic use of grazing animals. The third stage (Phase III) is where the plant elongates and leaf area is replaced by lignification. Plant cell walls become increasingly thicker and photosynthesis is significantly reduced as plants stop growing and energy for growth is no longer needed. Plant roots are no longer important as the growth stage has finished and root zones become much reduced. Grazing animals halve their intake of Phase III plants because their stomach microbiology takes twice as long to process lignified grass. The combination of reduced intake and a 50% loss in nutritional value means Phase III plants have a very low production capacity. All efforts must be made to reduce this phase as much as possible. Root activity and growth phases. Regenerative grazing has a significant positive impact on the ecology that supports the grazing system. Plants in Phase II have actively growing root systems and keeping plants in Phase II for longer periods increases root bulk immensely. Plant microbiology has a symbiotic relationship to plant roots, where roots supply sugars (energy) in exchange for soil borne minerals and nutrients. The more root bulk the better the soil health. The primary objective for regenerative grazing is to maintain grasses in Phase II. The plants in Phase II are optimising the sunlight energy for photosynthesis by maximising green leaf mass or chlorophyll. Energy produced through photosynthesis is used to grow the plant leaf area and root mass as well as maximising the energy available to soil microbes. The maximisation of root mass is the primary pathway to building soil microbiology and humus and soil health is the primary pathway to restore ecological health and balance to an ecosystem. If the prime objective of regenerative grazing is to maintain plants in Phase II then the grazing management is based around the plant recovery period. The recovery period required by a plant is the time it takes to regrow from defoliation until the root reserves have been restored, from the bottom of Phase II to the top of Phase II. The recovery rate is therefore a function of growth rate. 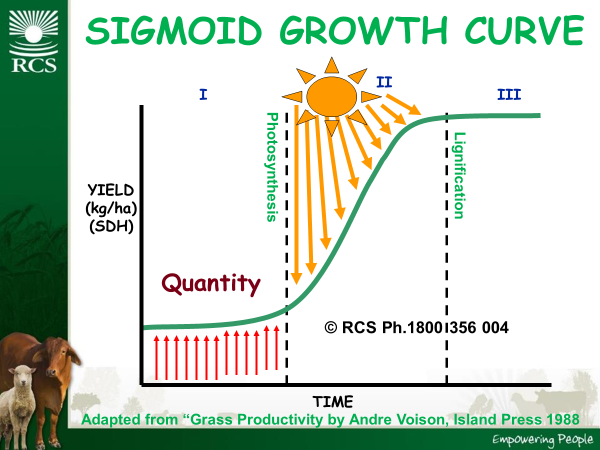 Graze periods and rest periods change as growth rates vary from season to season and from month to month. The objective of regenerative grazing is to manage those graze periods and rest periods with grazing animals to optimise plant growth and plant health. By restricting grazing animals, we can allow plants to move from Phase I into Phase II. Animals will keep returning to the most desirable plants until they die. Therefore, constant grazing causes pastures to move towards less desirable species and weeds. 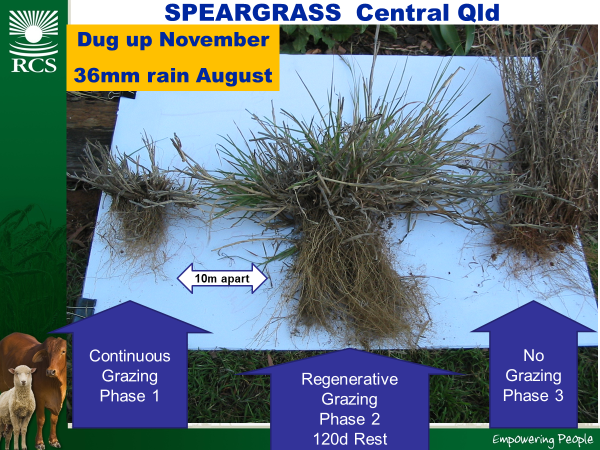 Implementing regenerative grazing, allows pastures to move away from Phases I and III towards a highly desirable, diverse and healthy stand of Phase II grasses. Regardless of the intensity of your grazing system, rest is powerful management tool to apply to allow for plants to effectively establish themselves and/or recover after grazing. What rest period is right for you? That depends completely on where you are, what plant composition you have, what the season has been like, what infrastructure you have available and what outcomes you need to achieve. We can help you determine what options to look at via the RCS courses and on farm professional advice. Firstly, let’s define what these two terms actually mean (they are not the same). Stocking rate is the number of animals that are utilising an area of land at any one time. Traditionally Australian agriculture has quoted carrying capacity in head per hectare… This approach has two major flaws that result in significant losses to the grazing industry each year. Firstly, each different business has a different interpretation of what one ‘head’ is. Even for cow/calf operations there is a large variation in average size of cow (from 350-800kg live weight). Then, there are all the different enterprise options available to us (merinos v crossbred, fat lambs, wethers, feedlot supply, fattening). For this reason, we recommend looking at this topic on a Standard Animal Unit (SAU) basis using either of these two units. These units take into account the animal’s feed requirements based on standard animal units and the area on which that animal is based. Therefore, the amount of feed one LSU or DSE eats in one day is a relatively constant volume of dry matter (regardless of what class of animals makes up that LSU or DSE). We refer to what one LSU eats in one day as one Stock Day (SD). What one DSE eats in one day is one DSE Day (DD). That can then be calculated on a per hectare basis to give us Stock Days per Hectare (SDH) or DSE Days per Hectare (DDH). We can assess both stocking rates and carrying capacity using this unit of measurement. Secondly, the traditional measure has ignored the variability of the Australian climate and the variability of the land areas carrying capacity in different seasonal conditions. 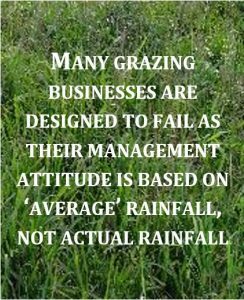 Many grazing businesses are designed to fail as their management attitude is based on ‘average’ rainfall. Average rainfall years are very rare in most regions. This lapse causes many grazing operations to subjectively “guess” carrying capacity levels from season to season and year to year. Miscalculating carrying capacities can cause severe droughts and subsequent drought feeding which, in turn causes intense economic strains and ecological destruction. 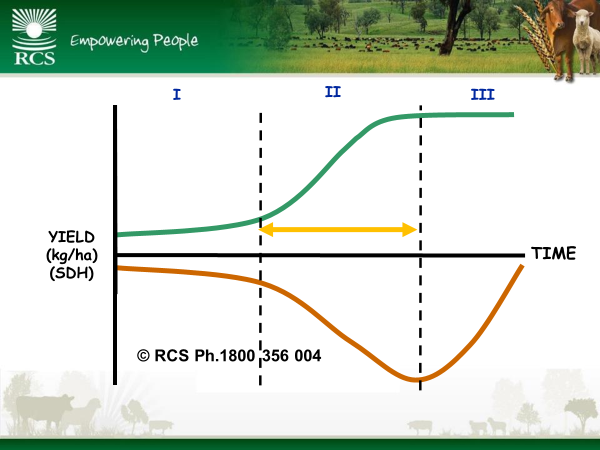 RCS has developed a system of assessing carrying capacity based on SDH or DDH per 100mm rainfall to account for this variation. Rainfall must be included to account for the seasonal variability and changes in carrying capacity. A common characteristic of regenerative grazing is the proactive changes made to stocking rate as seasonal conditions change actual carrying capacity so ground cover and plant and soil health is always maintained regardless of the seasonal conditions. Drought can be defined as ‘not having stock feed when you expect to have feed’. The grazing chart is a monitoring tool that measures the grass yield taken out of paddocks (SDH or DDH), as well as rolling 12-month SDH/100mm or DDH/100mm. This is used to provide a leading indicator for required changes in stocking rate by comparing to your benchmark carrying capacity calculated based on the ability of that land type and water cycle to convert rainfall into useable fodder. The first time you see this, it takes a bit to understand, however after you’ve mastered this skill, it is worth a lot of money! In most businesses it is worth hundreds of thousands of dollars a year. As you implement these principles, you will increase your water use efficiency. This in turn will increase the volume of usable feed you grow from each 100mm of rain. This, combined with reduced stress and pressure from not running out of fodder are all outcomes we love seeing in our client base. There is no point being in the ‘green’ with healthy ecology if your business is in the ‘red’ by making a loss. These topics are all covered in-depth in the RCS courses or one of our advisors can visit your property to discuss how to directly maximise animal performance and farm planning. Stock density is the horse power in grazing management. The higher the density the higher the power – and therefore the rate of change: positive change if principles 1 to 4 are followed, negative change if they aren’t! Density is measured in head per hectare as it is the physical action of hooves and mouths that creates the power of this principal. Density serves two key purposes, top down utilisation of pastures and animal impact. Top down utilisation reduces the impact of patch grazing which results in over grazing and understocking of paddocks. Animal impact assists with breaking up crusting on the soil surface, opening up dense crowns to sunlight for new growth and, particularly in brittle ecosystems, assists with getting organic matter onto the soil surface for mineral cycling. Experience has shown us there are five key density ‘thresholds’ which are discussed in RCS courses. Diversity really is the key to resilient ecosystems. The higher the diversity, the more likely your land is able to withstand climate variation and create abundance for you. So, what is diversity? Diversity in plants means having a wide range of plant types and species e.g. annuals and perennials, grasses, legumes, shrubs, trees and herbs. Diversity in animals means running different species together e.g. cattle and sheep, goats and chooks or cattle, goats and camels etc. Diversity we can’t see means managing to improve the volume/amount of fungi, bacteria, worms, beetles, vertebrates, invertebrates etc. The ecology sections of the RCS courses explains how we influence diversity and what impact it has on our productivity. Put simply, the higher the diversity the healthier our soils. A wonderful summary of some long-lasting research into diversity is from the Jena Experiment in Germany. There is a great short video available here that sums up the Jena Experiment and why we need diversity in our grazing lands. To download a PDF version of this overview, please click here.